Unpredictable forces of nature such as gusty breezes and swaying tides often trouble recreational skippers when attempting to dock their boats in a crowded harbor. A sudden rush of wind, for instance, could easily catch the bow or stern of a docking boat and blow it past the designated slip. Seasoned boaters, however, tend to take the elements of wind and sea in stride when coxswaining in marinas. Moving with the flow, they often use the momentum and direction of moving air mass and sea waves to gently steer their vessels into narrow slips. The idea is to harness or tame the elements in front of you to your advantage, whether it relates to docking a boat or investing. Akin to intermittent wind and tide, which can assist experienced skippers, there are exogenous factors impacting global financial markets which skillful hedge-fund managers can tap in their quest for alpha, which we define as a risk-adjusted measure of the value that an active portfolio manager adds to or subtracts from a portfolio’s return. A number of factors—such as rising US interest rates, the recurrence of big fluctuations in global currencies, and the widening dispersion of equity returns across sectors and regions—may have helped to create an increasingly conducive environment for hedge-fund strategies, which have seen a positive turnaround in performance in recent quarters. After hovering near zero for seven years, US interest rates started moving higher in late 2015. Empirically we can observe the turnaround in hedge-fund strategy performance (since early 2016) corresponded with the rise in US interest rates. Statistical analysis of the historical relationship between interest rates and alpha supports the notion that hedge funds generally do better in a rising-rate environment. The logic is straightforward: When interest rates are rising, there will be wider dispersion of returns across different asset classes, thus creating more trading opportunities for the alpha-capturing hedge fund managers. Alpha can be more pronounced and stronger during specific economic cycles or investment milieus, such as periods with higher interest rates. It can be weaker and insipid in other phases. The chart below highlights the positive correlation between alpha levels (relative to the S&P 500 Index) on the Hedge Fund Research Index Fund Weighted Composite Index (HFRI FWI)3 and interest rates, as measured by the five-year US Treasury yields, over a 26-year period from January 1991 through April 2017. 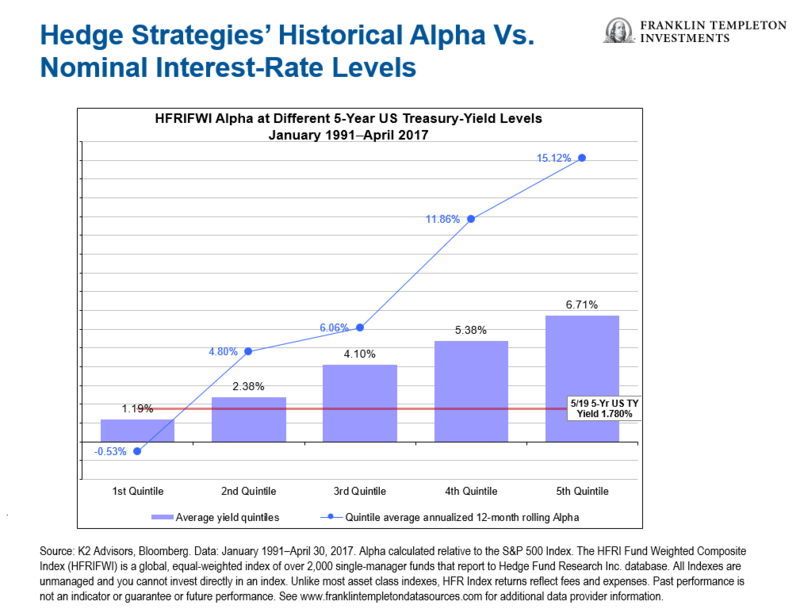 It shows that higher nominal interest rates historically corresponded with above-average annual alpha for the HFRI FWI. For instance, when rates moved to their highest level (represented by the fifth quintile bar on the right side of the graph), average alpha levels similarly surged to the uppermost level. In essence, rising interest rates historically have tended to benefit certain types of hedge-fund strategies. In particular, long short equity and fixed income arbitrage. In the equity space, when interest rates move higher, companies with weak fundamentals could face mounting pressure as they may be limited in their ability to take advantage of lower interest rates to finance their business operations. Debt-laden firms could also experience additional financial stress as borrowing costs mount when interest rates start to climb. On the other hand, a rising-rate environment could benefit cash-rich companies, whose financial statements will potentially look better as a function of interest income earned from their cash surplus. The deterioration in operational performance, profit margins and financial strength of weaker listed companies could weigh down their stock prices when interest rates are moving higher. Meanwhile, shares of fundamentally solid companies with excess cash could get re-rated on the back of higher interest income. Theoretically, then there will be greater price dispersion between the stocks of weaker companies and those that are fundamentally stronger when interest rates trend higher. This could create trading opportunities for long short equity managers, which may have a more well-defined universe of stocks, in terms of potential winners and losers. In the fixed-income arena, longer-duration4 bonds tend to be more negatively impacted when interest rates move higher as compared with shorter-duration fixed income securities. With the paradigm shift in the US interest-rate cycle, fixed income arbitrage managers—similar to the long short equity players—could profit from more trading opportunities in their hunt for alpha. For example, they could seek to buy resilient bonds that pay decent coupons with limited price downside while simultaneously shorting fixed-income securities that look vulnerable when interest rates and inflation expectations trend higher. Indeed, the downturn in the US government-bond market at the end of 2016 and earlier this year benefited many fixed income arbitrage managers who were able to take advantage of the price decline in US Treasuries during those periods. Hedge-fund strategies generally didn’t do well in 2014 and 2015—a period when the erratic “risk-on” and “risk-off” trading patterns were prevalent in global financial markets. Investors generally moved large pools of money in and out of asset classes in lockstep. In our view, that difficult epoch for hedge-fund strategies now appears to be over. Of late, global investors have become more discerning in their investment selection and asset allocation processes, with more emphasis on fundamental factors. This has resulted in greater price dispersion and more trading opportunities across different individual securities and asset classes, which we think has helped hedge funds to record better performance in general. Event-driven and long short equity managers, for instance, have overall seen rosier average gains over the past 12–18 months on the back of investors’ growing focus on company-specific events, earnings growth, balance sheets and valuations of individual securities across different sectors and regions. At the same time, investors who may be unsure about the prospects of equities and bonds seem to be starting to allocate more money to hedge fund strategies that aim to capture alpha in both up and down markets. The “double active” hedge-fund managers, who dynamically pick potential winners and losers regardless of the market cycles, also aim to provide some downside protection to investors when market conditions deteriorate. All in all, we think the current market conditions look conducive for a variety of hedge-fund strategies. The uptrend in US interest rates, wide swings in global currency markets and greater price dispersion across individual securities and asset classes could serve as powerful tailwinds for hedge- fund strategy managers looking to capture alpha. All investments involve risks, including possible loss of principal. The value of investments can go down as well as up, and investors may not get back the full amount invested. The identification of attractive investment opportunities is difficult and involves a significant degree of uncertainty and there is no assurance any such alternative investment strategies will be successful. An investment in these strategies is subject to various risks, such as those market risks common to entities investing in all types of securities, including market volatility. It is always possible that any trade could generate a loss if the manager’s expectations do not come to pass. The market values of securities held in the K2 portfolios will go up or down, sometimes rapidly or unpredictably. Hedge-strategy outlooks are determined relative to other hedge strategies and do not represent an opinion regarding absolute expected future performance or risk. 1. The HFRI Global Hedge Fund Index is designed to be representative of the overall composition of the hedge-fund universe reporting to Hedge Fund Research Inc. database. Indexes are unmanaged and one cannot directly invest in them. Unlike most asset class indexes, HFR Index returns reflect fees and expenses. Past performance is not an indicator or guarantee of future performance. 2. Ibid. Year-to-date through May 26, 2017. 3. Alpha calculated relative to the S&P 500 Index. The HFRI Fund Weighted Composite Index is a global, equal-weighted index of over 2,000 single-manager funds that report to Hedge Fund Research Inc. database. Indexes are unmanaged and one cannot directly invest in them. They do not include fees, expenses or sales charges. Unlike most asset class indexes, HFR Index returns reflect fees and expenses. Past performance is not an indicator or guarantee or future performance. 4. Duration is a measurement of a bond’s sensitivity to interest-rate movements.